Creamy vanilla cream puffs rise freshly baked, fluffing up amidst steaming chocolate brownie dough. Oops! I must be hungry! I am looking at mushrooms, tender and soft, recently emerged, fresh and moist. They are a wonder and they engender tender feelings in me that don’t really make sense. I know that. I want to touch them and fold them into my arms to protect them. I want to hide them from those who’d try to eradicate them. Mushrooms are just so perky and magical looking. They defy the odds and redefine beauty by popping out of damp dark soil. They need no blooms to be spectacular. White, not green; spread by spores, not seeds; fungi, not annual, mushrooms are perpetually misunderstood. 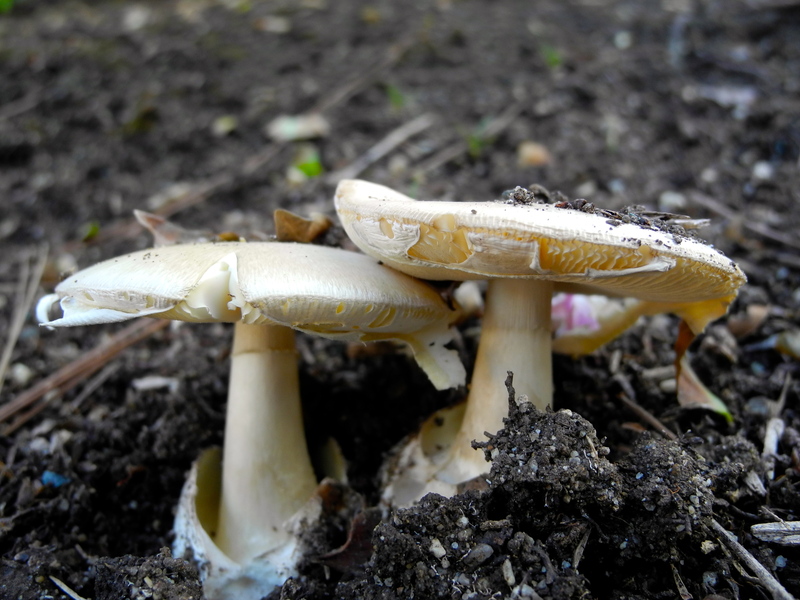 Mushrooms are a perfect weed among weeds for the outcast loving weed hunter. I like to celebrate the underdog and praise the efforts of those who overcome odds to claim their place in this world. I am in awe of the effort it takes to lift part of a hill up overhead just to see the sunshine. The humble creatures get my attention over the loud colorful ones who make a din in their bid for the spotlight. Let me look closely and find something magical in your garden. Allow yourself to look closely and discover what lies hidden in the damp, in the shadows, and perhaps in plain view.